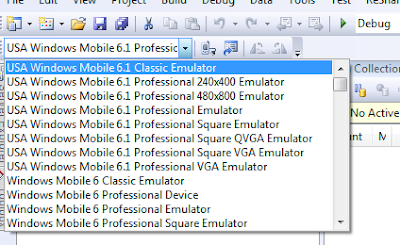 As you've probably heard by now (announced at Tech Ed EMEA) that Windows Mobile 6.1 Pro and Standard emulators have been released and can be downloaded from here. One thing I thought I'd mention is the support for WVGA screens (800x640) with these new emulators. So you can test for devices such as the new Samsung i900 or the HTC Touch Pro without having to actually own these expensive devices. 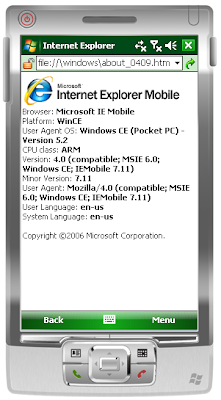 Also IE 6 on 6 (Internet Explorer 6 Mobile) is included in these emulator images. If you don't know what 6 on 6 is, it is the IE engine running on the device. I'm not a "web" guy but this is pretty cool stuff. But sadly this version of IE requires a new ROM image which means you will have to buy a new device or wait for your device OEM/carrier to issue a flash upgrade.